Because of our camp’s position beneath the Barranco Wall, the sun crested the mountain later than usual, and we woke to a very chilly morning, eager to get moving to build some heat. Today’s hike began in dramatic fashion with a steep ascent of the Barranco Wall. This was a 300 meter vertical scramble during which we had to pack away the trekking poles we typically use and rely on our hands to pull us up and around the rocks. It was slow-going and nerve-rattling at times, and we were humbled every time the porters would pass us with their heavy loads perched atop their shoulders and heads. How they manage to make these tough climbs with such apparent ease continues to baffle us. It wouldn’t be surprising to learn that they were part mountain goat. We eventually made it to the top in about an hour, sweaty and ready for a break but exhilarated by the accomplishment. The view from atop the wall was worth every bit of effort it took to get there, with the south face of Kili cloaked in glaciers to our left and Mt. Meru floating above the sea of clouds to our right. We enjoyed taking in the view and chatting with other groups of exhausted hikers as they reached the amazing vantage point. The trail then descended into two more valleys before our final climb to Karanga Camp. The Karanga Valley is quite steep, and its namesake river provides the last source of fresh water before reaching Barafu Camp, tomorrow’s camp and the base for summiting. We were surprised to learn that porters would have to descend back down the valley to collect water here and then haul their heavy plastic jugs another 3 hours and 700 meters up the trail so that we could have water for drinking, cooking and washing the next day! Being a porter on Kili has to be one of the toughest jobs around, and the grueling pace was clearly taking its toll. Unfortunately, we lost another porter this morning at Barranco Camp due to sickness, our third now, and we discovered that a fourth from our team was injured and not fairing well. Nelson, the youngest of our team, had fallen and scraped his leg during yesterday’s hike. We passed him as he hobbled his way up the Baranco Wall in clear pain. When I offered to grab his load at one point, I was shocked by how heavy the unwieldy bag he carried was. Undaunted, Nelson thanked me as he grabbed the cumbersome load and pressed on. We relaxed in camp after a much-needed washing of the feet. Despite wearing gaiters, trail dust manages to work its way in everywhere. Once again, we took an acclimatizing hike before dinner further up “the hill” and were rewarded with gorgeous views of Kili looming over us as the orange glow of the setting sun lit up the cairns that passing trekkers had erected to mark the trail. We headed back to camp for another delicious dinner and were shocked to be served watermelon (of all things!) for dessert. Incredulous, we asked Rashid which of our poor porters had been assigned to carry the heavy fruit for the past five days. Our hearts sank a bit upon learning it was poor Nelson, who we watched suffer scaling the Barranco Wall earlier that morning. No wonder his bag felt like it was full of rocks! We made Rashid promise that he would serve any watermelons to all his future clients on Day One of subsequent trips. Exhausted from the long day, we settled into our sleeping bags conscious that this would be the last full night of sleep before attempting our summit tomorrow night. So it wasn’t just me who found the wall a little nerve wracking at times. It did make for an interesting climb. We also had a couple of porters go back down due to altitude sickness. Just goes to show they’re not as superhuman as they appear to be, but man they’re strong and resilient people. And lucky you stayed at Karanga. I wish our group had. Great post! Thanks for reading! There were definitely parts of the wall that were out of our comfort zone, but, overall, it was a pretty fun challenge. 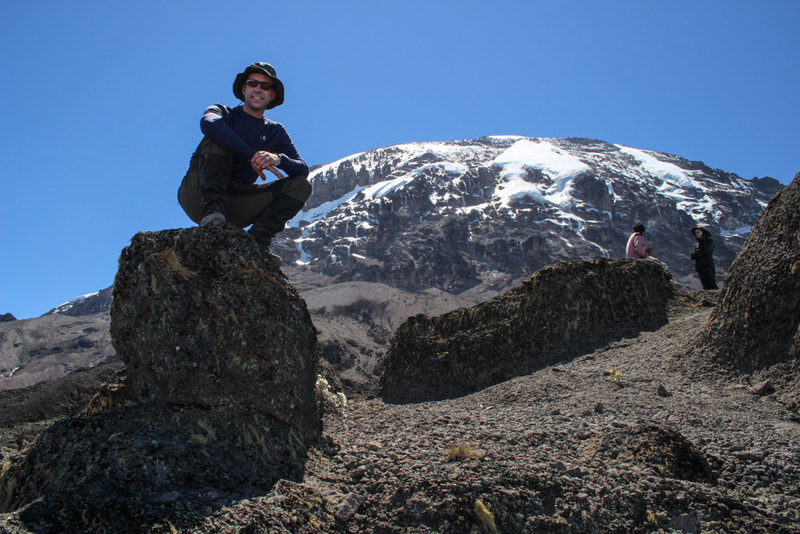 Did your group hike all the way to base camp from Barranco Camp in one day and then summit that same night? We ran into several groups doing that and couldn’t believe it. It must have been absolutely exhausting! 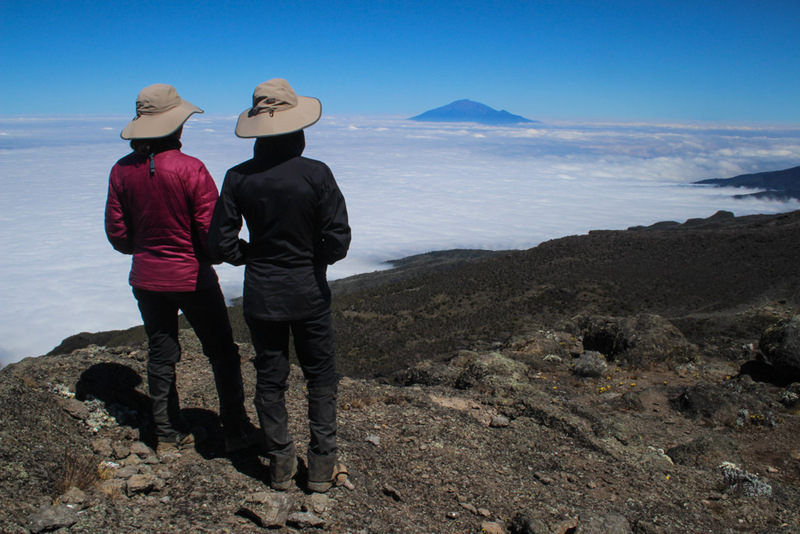 Yes we did hike all the way to base camp from Barranco Camp and I was very tired (and cold) when we arrived. By the time we had dinner we only had about 3.5 hrs to rest before heading for the summit. I wish we had stayed at Karanga and had the extra day. Nice post, Alison and Matt! I bet that watermelon didn’t taste quite as good as it should have after a hike like that. I feel really bad for the poor guide who had to carry it on his back all that way. It sounds like it was a great day– full of adventure as always. Way to go! You are so right, Andy. If we had known poor Nelson was carrying a watermelon for us, we would have insisted on carrying it ourselves. What a tough job those guys have! I hope Rashid keeps his word!! As you said, the job of a porter sounds so incredibly grueling… Loving all these photos so far! It’s fun to see the day-by-day progression of your trek. Thanks, Melissa. We wish we could have taken more photos, but we found that we were more focused on the hiking than the photography most of the time. It was a nice way to take our mind off of the hike whenever we stopped for a rest.